One great thing about this otherwise terrible primary is that people are learning things they’ve never thought of before. Nor had to. Like those boring conventions no one watches every four years, or how delegates are selected, and what “contested” conventions are. But there is misinformation out there, and I’m going to attempt to explain it. First, understand that local, state and national parties are set up similar to how the Founders established our governments. Our governments were set up as representative republics, with rules decided as much by mutual consensus and not by the mob mentality of direct democracy. The GOP is very similar. They are made of delegates who run for the position from among you and me, they vote on committees to represent them. Those people vote on chairmen and if necessary, nominees for public elections. You can learn more about that process HERE. A contested convention is NOT run by the “establishment” and the “brokering” is the physical act of delegation chairmen, delegation committees and the delegates themselves engaging in negotiation. That’s normal. At least it was. 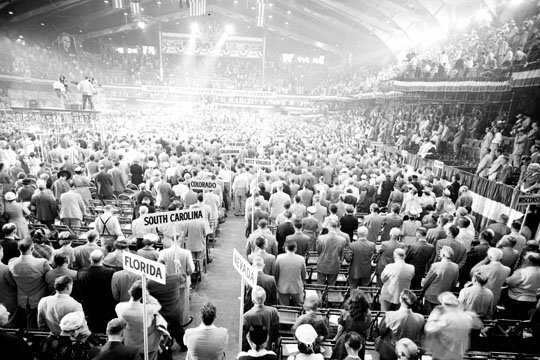 in the pre-television age most political conventions were “contested” and the candidates were working within the system set up by us to sway allegiance and come to consensus. Since TV and the Internet have come about, the selection has become more of a personality contest, a performance. But in the end, the decisions are made by us. Or those we choose, that is. That’s not “establishment,” it’s not run by “the party bosses,” it’s not done in “cloakroom deals.” It’s rational, fair and allows unity to form. Some people are speaking about things they do not understand or buying the misdirection unfortunately coming from Ted Cruz, who the other day said he was okay with a “contested convention” but not a “brokered convention.” Unsurprisingly, throngs of people have suddenly began talking like experts about a rather nuanced political activity. It’s like “cloture,” a word no one had heard of before 2010, and now is used as the deciding point between deity and the flames of hell. The GOP has conducted 10 actual “brokered” conventions where the nominee was someone who did not have a majority of the delegates. The 1976 convention didn’t result in a contested convention, as some of the delegation came around in a close race to nomination Gerald Ford. Contrary to critics, some of our best candidates have come from these and it does not violate the will of the voters. The voters, after all are engaging in preference polls. Not direct elections. (This may come as a shock to many) The rules are decided by state parties and the national conventions. It should be noted that nearly all the people who criticize a contested convention do so because their candidate may likely lose such a convention. Those who win contested conventions are the unifiers, the consensus candidates, and those who can provide the most benefit to the base and the country as a whole. Abraham Lincoln, Dwight Eisenhower, James Garfield. The folks over at the Federalist put together a fantastic piece describing the history behind every contested election in the Republican Party since 1860, which obviously gave us the candidate we needed. I encourage everyone to read every word HERE. TIME Magazine put together a brilliant explanation of what would and might happen at a contested convention, which can be read HERE.